Passages to the Past: The 2010 Historical Fiction Reading Challenge hosted by Royal Reviewers! The 2010 Historical Fiction Reading Challenge hosted by Royal Reviewers! I usually don't do reading challenges because I'm not very disciplined and never finish them, but this one is made just for me and I'm pretty certain I'll be completing it! 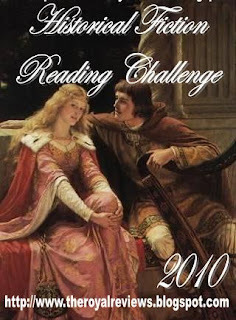 The Historical Fiction Reading Challenge 2010 is hosted by my favorite ladies at Royal Reviews. Rules are posted below. I'll be going for the Obsessed level! I've already joined up, will I be seeing you there? I am so working on my giant reading 2010 challenges post. I am just going to put them all on the same post so I can find them all and not forget. Thank you Amy I will be adding this one to the list! I'm trying to decide if I should go for 12 or 20 in this challenge. I know 12 would be no problem. I certainly could have reached 20 easily this year, but with so many challenges next year I'm not certain. They should have another level above obsessed since you love HF so much! You will see me there of course! I went for obsessed too, and I don't think any of us will have a problem. Best of luck! I am signed up for obsessed as well! Shouldn't be that much of a surprise I wouldn't think! I already signed up for the Year of the Historical Reading Challenge Lurv a la Mode is hosting. But I might sign up for the Curious Level here so I can play along with you girls as well!